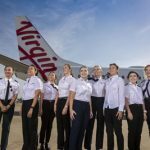 Virgin Australia today announced it has exceeded its target of an equal intake of males and females for its 2018 Pilot Cadetship program, achieving female representation of 56 per cent, a 200 per cent increase on the previous program. Virgin Australia Group Executive People, Lucinda Gemmell said: “Virgin Australia is committed to increasing gender diversity across all areas of our business and in particular the non-traditional roles of aviation. We are thrilled to have exceeded the gender target that we set for ourselves for the next intake of the pilot cadetship. “Both the young men and women who have been accepted into the next program are all extremely passionate, talented individuals and we are very much looking forward to welcoming them all into the Virgin Australia family,” Ms Gemmell said. The recruitment process for the program is run over a 13-week period and involves rigorous skills-based and academic testing, designed to identify the most promising talent among candidates selected for the assessment phase. Virgin Australia Director of Group Flight Operations, Stuart Aggs said: “We were incredibly impressed with the strength of the applicants for this year’s program. We received more applications than ever before which has allowed us to select the best individuals for our next cadetship. “At the end of the day, the selection process is merit based, and the application and assessment process sets a necessarily very high standard. Candidates are exposed to screening and panel interviews, abilities testing, personality profiling, computer based learning and examination, and reference checks. We also look at cultural fit, motivation, passion, and community involvement,” Mr Aggs said. This announcement comes after the Virgin Australia Group was selected by Tamworth Regional Council in October as the preferred airline group to establish a world-class pilot training centre in the New South Wales city. “The future looks bright for this next generation of pilots, and we’re excited to have the opportunity to play a part in the development of this promising group of cadets and welcome them to what is a very exciting industry,” Ms Gemmell said. The 2018 Pilot Cadetship will run for 54-weeks at Flight Training Adelaide in South Australia, where cadets are trained by some of the best instructors in the industry. At the end of their training, the cadets will graduate with a Commercial Pilot Licence and will be offered roles as certified First and Second Officers with Virgin Australia. Find out more about the Virgin Australia Pilot Cadetship program here, and find out what a day in the life of a Virgin Australia Pilot Cadet is like by watching this video here.